Refers to the martial arts of kicking and punching. Kickboxing is a standing sport and it is a total body workout.Some benefits of practicing Kickboxing are: get in shape, lose weight, muscle tone, increase of strength, flexibility,balance and coordination. 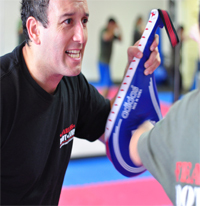 Kickboxing is also a good way to learn and develop self defense skills. What do you do in class? and What I need to wear? 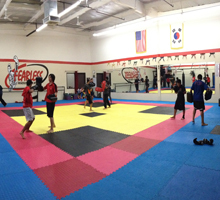 Our Kickboxing classes offer a wide variety of aspects and our sessions offer a different workout every day. 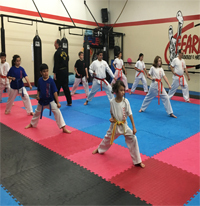 Generally they include run, jump a rope, streching, boxing drills, kicks, self-defense, semi-contact sparring and drills work of pad, shields and bag training. Just wear comfortable sport clothes and be prepared to have fun at the same time you are getting healthy. Do I need to be fit to do Kickboxing? Not necessarily, in fact a lot of people actually join Kickboxing to get fit! In parts, fitness does help but the Instructor know that everyone is different and always try to ensure students push themselves where they can in attempt to attain higher and better personal levels and goals. Are there people my age doing Kickboxing? We have students as young as 13 years old up to 65 years training with us!